These are the travel agents I recommend in Greece. The travel agencies listed on this page are small enough to give you personal service, yet large enough to have the organization to handle all your travel needs. They all speak fluent English as well as several other languages including French, Italian, Spanish and Portuguese and they all love Greece and being travel agents. Greece as a country is perched on the cusp of Europe and the Middle-east, a first world country with a third-world infrastructure which usually means that if something can go wrong, it will. That is the value of a professional Greek travel agent. When something does go wrong they know how to handle it since they have seen and experienced every problem you can imagine and more. If there are problems, you probably won't even know about it because they will have worked behind the scenes to fix it. Fantasy Travel (photo): Located in Athens a block from Syntagma Square have low rates on hotels, cruises, individual itineraries and tours and provide prompt and efficient service. 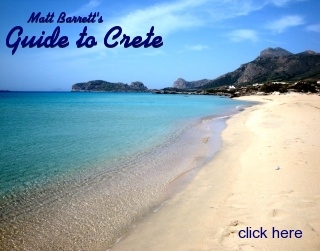 They specialize in the Cyclades Islands, Crete and Rhodes. That's Litsa from Fantasy in the photo. Aegean Thesaurus: Based on the island of Sifnos they are a high-tech travel agency capable of booking hotels, tours, cruises and transportation on all the islands and the Greek mainland. Dolphin Hellas: Located in Athens, they are one of the oldest and most respected travel agencies in Greece and have been in business since the seventies. Great rates on hotels, cruises, individual itineraries and tours. Experts on all the Greek islands and mainland. George the Famous Taxi Driver: Though George is not a travel agent in the sense that the above are, focusing mainly on transfers & tours of Athens and Mainland Greece, when you book an overnight tour or a trip of several days he does everything a travel agency does from booking your hotels, arranging meals, and making sure you are picked up and delivered to your hotels, the port or the airport. Hotels of Greece: Not every hotel but most of em.